Every professional-grade instrument needs to perform like one. 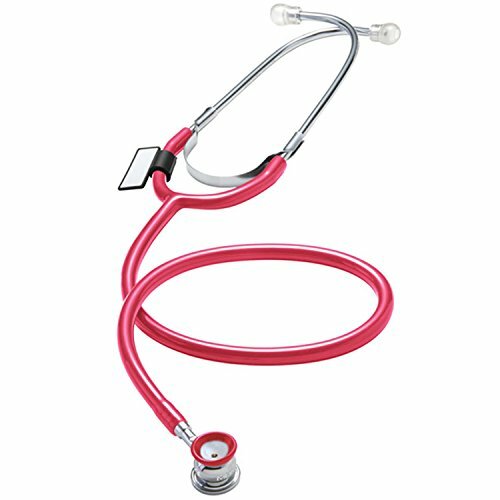 That is why we have developed the world's first premium, single-patient, non-cross contaminant stethoscope. The affordable and high-performance MDF® Singularis® VIVO® Infant Stethoscope is unmatched by any infection control, disposable or biohazard stethoscope on the market. Chestpiece: The handcrafted lightweight infant and neonatal dual-head chestpiece, fitted with a unique raised ultra-thin fiber diaphragm and full-rotation acoustic valve stem, is constructed of quality chrome-plated brass. The deep, cone-shaped infant bell, crowned with a non-chill bell ring, provides greater sound amplification, isolation of low frequencies, and patient comfort. AccuFit® Headset: Adjustable stainless steel and brass headset allows the user to create an individualized fit. Soft silicone ComfortSeal® eartips (available in standard and small sizes) are clear for hygienic purposes and conform to the ear to seal out extraneous noise while ensuring comfort during extended use. Patented SafetyLock® eartip adaptors lead the industry in user safety.